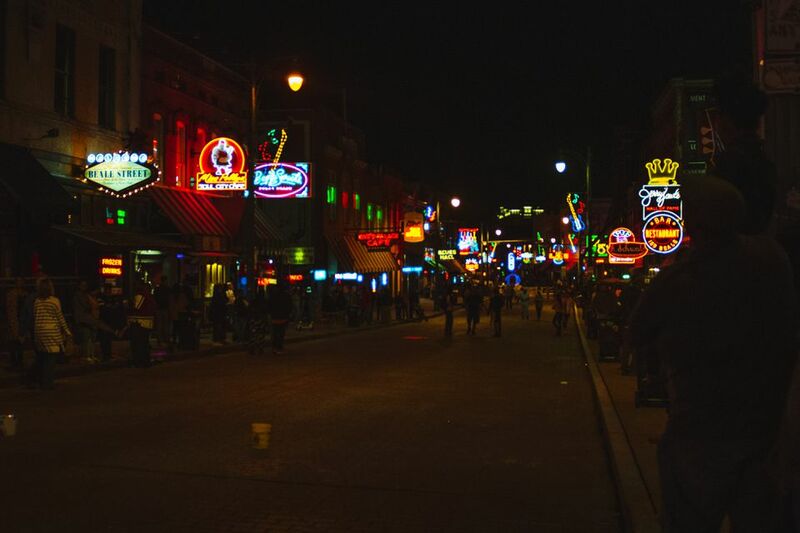 Beale Street is the very heart of musical entertainment in Memphis. With more than 25 clubs and shops lining the street, it's no wonder that the world-famous Beale Street attracts both locals and visitors alike. You'll find a variety of classic music genres like blues, jazz, rock 'n' roll, and gospel. As you walk Beale Street, the sounds spill out onto the street enticing you to come inside and listen. This is an alphabetical listing and description of Beale Street's bars, restaurants, and clubs so that you can make the most of your next trip to Memphis. It's hard to imagine that a place as popular as Beale Street could have a hidden gem, but Absinthe Room absolutely fits that description. Walk up the black-lit staircase to a cozy, vintage-style bar that serves absinthe the traditional way—with ice water, fire, and sugar cubes—plus pool and a jukebox. You can cozy up on the couch or look down on the Beale Street action. Alfred's Restaurant and Bar is well-known around town for its fabulous food and great live music. Alfred's was the first club on Beale Street to feature Rock 'n Roll music. Currently, they feature a variety of genres including acoustic bands, soloists, and even the Memphis Jazz Orchestra, which plays every Sunday night. They offer two patios perfect for both relaxing and partying, as well as a huge dance floor, and karaoke several nights a week. The Memphis location of B.B. King's Blues Club was the first of this national chain of clubs. They always have great blues bands and a good-sized crowd. Enjoy traditional barbecue, shrimp and grits, and their luscious signature cocktails. You can dance to live music almost every night. The Blue Note, sometimes called "Lew's Blew Note," is a casual (read: kind of dicey) bar and music venue on the quieter end of Beale. There's live music Wednesday through Sunday nights and no cover charge. With big-screen televisions and a vast selection of draft beers, this is a true tap room. To pair with your brew, try the Memphis style barbecued ribs, shrimp and crawfish etouffee, or chicken Pontalba (a New Orleans Creole dish). On the weekends, catch a live blues act and throw back a cold one. The Blues City Cafe serves up some of the best Southern food in the city like fried catfish, barbecue ribs, and homemade tamales in addition to some of the best live music playing each night. If you've seen the movie then you know what this bar is all about. While it seems a little out of place on Beale, it's a popular chain and a staple of bar scenes around the country. If you get the desire for some dancing on a bar, you know where to go. Club 152 is a notorious late-late night party and dance spot on Beale. There are three floors. The first floor hosts live blues, rock, and soul music plus Southern food. The second level is a private club for service industry members only. The top level, The Shadows, is like the nightclubs you see in movies and music videos; expect loud, exciting dance music, VIP lounges, and plenty of dancing—it's on Friday and Saturdays only. No matter which Dyer's location you visit, you can get one of their famous burgers fried in almost 100-year-old grease. Since their opening in 1912, Dyer's has not changed out the grease in their fryers. They have added to it and transported it, but have never changed it completely. This is a perfect spot for a late night Double Double (two meat patties, two slices of cheese) to soak up all those Beale Street beers. The Memphis location of the world-famous Hard Rock Cafe serves up great food and music as well as a merchandise store full of Hard Rock souvenirs. In addition, music lovers will enjoy the music memorabilia filling the walls of the cafe. Infamous Memphis wrestler Jerry "The King" Lawler opened his own club on Beale in 2016. Expect food—including the infamous Slam Burger, drinks, and special appearances from Mr. Lawler and his friends. Honor the rock legend by dining and drinking at his namesake club on Beale Street. There are multiple bars and areas, including a Flaming Fountain courtyard, the casual "backstage bar," plus balcony seating for the best view of Beale on the whole street. King's Palace Cafe is a fabulous restaurant and club that serves up jazz and Zydeco music and arguably the best Cajun food in the city such as crawfish, gumbo, and even alligator. The New Daisy is a venue that has hosted up and coming artists, major headliners, and independent musicians alike. If you are looking for a live show, The New Daisy almost always has something going on. In 2016, the New Daisy underwent an enormous renovation and now boasts a state-of-the-art sound and light system, plus amenities like VIP seating and private party rooms. People's is Beale Street's only pool hall and sports bar. People's has been in downtown Memphis since 1904. They boast that they are the "home of the hundred-year-old Brunswick tables." The pool hall features big screen TVs, an online jukebox, and of course, pool tables. The Pig is all about Memphis-style barbecue. Whether you want BBQ sandwiches, ribs, or smoked turkey, you can get it at The Pig along with great blues music all weekend long. The Rum Boogie Cafe is one of the most happening spots on Beale. There is always a great band and a vibrant crowd. For the best rum drinks on Beale Street and perhaps in Memphis, this is definitely the place to go. Home of the Diver (a giant alcoholic drink that comes in a bucket) and Beale Street's only goats, Silky O'Sullivan's serves up live music, beer, mixed drinks, and of course, barbecue. While the Tin Roof is a chain bar and live-music club, the Memphis location goes out of its way to create a unique Beale Street feel. Enjoy nightly live tunes on stage, DJs and games in "The Green Room" and plenty to eat and drink. Sure, you may have had a strawberry daiquiri before, but what about a Monster Melon or a Chocolate Thunder? At Wet Willie's, you can get those flavors and many many more. What really makes Wet Willie's famous, though, is the potency of their drinks — you get a lot of bang for your buck.